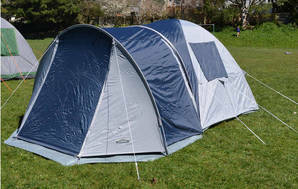 Snapshot: The Tundra Extreme 4P Discovery is a 4-person tent that weighs 9.9kg. Will it let you carry on camping? Relatively slow to put up (24 minutes) and take down (23 minutes). The pole clips weren’t easy to clip over the poles (this would probably become easier with use). No instructions sewn into bag.